Open Roads Forever Green Lawn Care provides several landscaping services in Saskatoon for residential and commercial customers. If you would like to keep it easy to water your grass or plants we can install underground sprinklers for your home. If you have a sprinkler system installed already we can always help with repairs too your system. Pruning can be simple or very complex. Pruning allows for a shapelier, tidier looking tree and helps control overall size and growth of certain branches. For the health of your trees, it is very important to always remove damaged, diseased, or dead branches. If you want to cut down a tree, but leave the stump, we have the equipment to do that. After cutting, if you want the stump removed, our experienced landscapers use a stump grinder to completely remove the stump. If you would like to take the hassle out of mowing your lawn, Open Roads Forever Green Lawn Care offers one-time, weekly, bi-weekly, and monthly lawn cutting services. With our power edging, we can also clean up the edge of your lawn giving it that professional look in no time. We have a number of chemical application services depending on your lawns needs. We offer one time applications of liquid or granular fertilizer. The grade of fertilizer used will depend on the season. To keep your yard looking good all summer, we offer a 5-step plan. This means that we come to your yard five times during the summer to fertilize and spray for weeds as required. Weed control is offered with our lawn cutting services, as well as on its own. Using specifications provided by you, our staff will design and draw up plans for your landscape project. Each design is tailored to your yards specific needs. In the spring, we prepare your flower beds for planting. 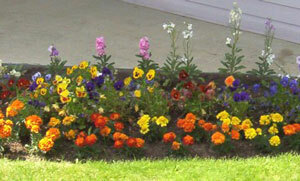 Once that is done, we can plant your flowers to give your flower beds the best look possible. Maintaining can be very time consuming. We offer maintenance programs to suit your needs from weekly to monthly maintenance. Each maintenance program is tailored specifically to your yard and may include weeding, fertilizing, and separating to name a few. We will remove your rubbish using a 1/2 ton, 1-ton, or 3-ton truck and trailer. We try and recycle whenever possible. We deliver 1-5 yard loads of soil or rock depending on your specific needs. With measurements, we can give better estimates as to how much product you will require.